1,537in³ Muffle Furnace w/ Digital Controller - Gilson Co.
MF-6A 1,537in3 (25.2L) Muffle Furnace equipped with front-opening door and a maximum temperature of 2,000°F (1,093°C), and comes with a digital controller that offers precise and multiple programming options. Interior chamber walls have 2.5in (64mm) minimum thickness refractory firebrick, mounted heating elements, and interior dimensions of 13 x 13.5 x 8.8in (330 x 343 x 224mm) WxDxH. Exterior of the unit is a painted, heavy-gauge steel case. It offers solid performance in ashing, ignition tests, gravimetric analyses and volatile matter determinations, as well as in testing soils, aggregates, and cement. Sturdy construction provides a long service life. 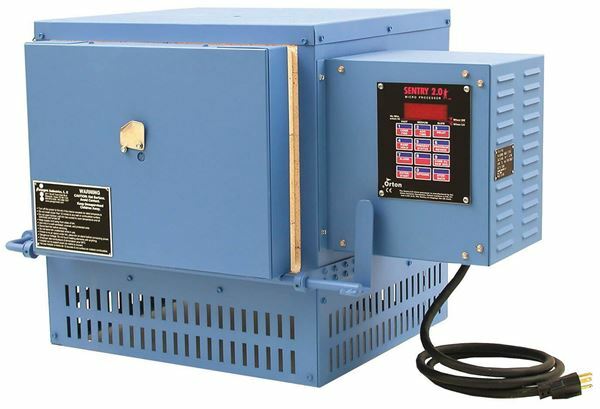 The furnace operates on 230V/60Hz/13Amps/3,120Watts, and includes the controller, power cord and plug.